The big news was that LSI has second generation SAS6 silicon ready to go. LSI was the first to get to SAS6, and now they are updating the line with a newer, faster, better version. At it’s heart, the new controller has two IOP cores, LSI claims that this will minimize times things are waiting for the controller to do something, clear a buffer, or shuffle bits. The new architecture makes a lot of sense on paper, and likely in practice too. 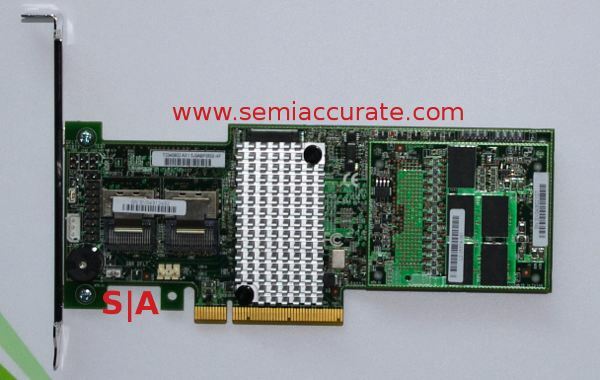 The first part available with the new chip is the SAS 9265-8i, an 8 port internal SAS6 RAID card. It is low profile, and obviously has a PCIe 8x interface. To the left of the heatsink, there is also a lot of open space for a very high bandwidth connector, so future expandability looks good. From there, we come to something I wasn’t expecting to see at CeBIT, a 16-port SAS6 switch. The name wasn’t listed, the sticker says DVT-1 but that is probably not what marketing will tell you. The interesting part is that this switch is 16 ports, but each port is 4 SAS6 lanes. That means 64 drives can be chained on to this little box. Actually, SAS is capable of having multiple drives per lane, so you could easily chain 4 magnetic drives off of each lane without impacting bandwidth meaningfully, 8 if you aren’t hammering them, and many more if you want to test the spec. To make things more interesting, SAS6 supports cable lengths of 6M for passive cables, more than enough for most people. If you look closely, the two ports on the top left have small lettering underneath that say ‘Active Cable’. This spec is basically a powered port, and allows you to have 25M cable lengths, LSI says they will have a 20M cable out in short order. Lets see, 16 * 4 * 8 drives with 6M cables, that should be close to enough for most, and fast enough for casual use.